WBPSC Motor Vehicle Inspector Admit Card 2019 is Out….!! Download the WBPSC MVI Admit Card 2019 from this article. Contenders can check all the information about the WB Motor Vehicle Inspector Hall Ticket 2019 from this post. The officials of the West Bengal Public Service Commission released the admit card on 26th March 2019 for the Motor Vehicle Inspector vacancies. Candidates should download the Admit Card from this page and attend for the examination on 7th April 2019. For the comfort of the candidates at the end of this page, we have given a link to download WB Motor Vehicle Inspector Hall Ticket 2019. Aspirants just hit on that link and download the Admit Card quickly. In the below sections, aspirants can check the steps to download the pscwbonline.gov.in Admit Card 2019. We have also provided the importance of the WBPSC MVI Call Letter 2019 on this page. Competitors need to get clarification about the WBPSC MVI Hall Ticket 2019 with the help of this article. The WBPSC Motor Vehicle Inspector Written Exam will be conducted on 7th April 2019 by the officials of the West Bengal Public Service Commission to hire the suitable people for the 74 Vacancies of the Motor Vehicle Inspector posts. The WBPSC MVI Admit Card 2019 is available now to download. The board authorities of the WBPSC planning to conduct the WBPSC Motor Vehicle Inspector Examination on 7th April 2019. For that, officials released WBPSC MVI Admit Card on 26th March 2019 at the organization website. The authorities of West Bengal Public Service Commission released the WBPSC MVI Admit Card before the test date. We advise each and every aspirant have to download the admit card or hall ticket at least one week prior to the exam date. The contenders must verify the details in WBPSC MVI Admit Card 2019 when it is downloaded. If the applicants found any corrections in the admit card then immediately inform the higher authorities. For more updates about the WBPSC MVI Admit Card 2019, candidates should visit the official website or our portal Sarkari Naukri regularly. Applicants can check the WBPSC MVI Recruitment 2019 from our web portal. Furthermore, the application dates and the application form information can gather from the official notification. All the contenders can know all the details of the registration process. To get more points related to the hall ticket can visit @ pscwbonline.gov.in. Even, we have arranged all the particulars of the hall ticket on this page. Candidates need to carry at least one document in the below-mentioned list for the WBPSC MVI Exam 2019. The WBPSC MVI Admit Card download link is given at the end of this page for the aspirant’s comfortable. 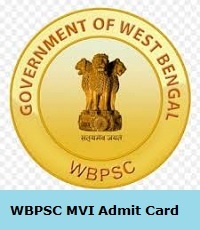 The West Bengal Public Service Commission issued the WBPSC MVI Admit Card 2019. Candidates prepare well for the Examination to get good marks in the written examination. Most of the organization releases the admit card or hall ticket a few days before the examination date. The applicants must verify the information on the admit card or hall ticket. The West Bengal Public Service Commission will recruit the job seekers through the selection process. The WBPSC MVI selection process contains the Screening Test/ Written Test & Personal Interview rounds. Firstly, the organization conducts the written test through this test the qualified candidates will have to attend the next selection rounds. The WBPSC MVI Admit Card 2019 contains the following details. The WBPSC MVI Admit Card 2019 is a mandatory document for the WBPSC MVI Examination process. The officials of any examination will not allow to the examination hall without the admit card. The Admit Card plays a major role in the examination hall. So candidates without fail must and should carry the Admit Card/Hall Ticket for the examination center. The admit card or hall ticket contains all essential information about the examination and participant details like Applicant Name, Photograph of the contender, Exam name, Exam Center Name, Exam Center Code, Exam Center Address, Applicant Address, Father’s Name, Instructions to the Candidates. With the help of this WBPSC MVI Admit Card 2019, the exam invigilator can easily find out the applicants in the examination hall. Every candidate has to reach in 30 minutes before the exam and check the information of examination instructions in WBPSC MVI Admit Card 2019 and also carry any identity like driving license, voter id and others issued by a state or central govt. Now West Bengal Public Service Commission home paged will open on the screen. Search for WBPSC MVI Admit Card 2019 link in Admit Card/ Call Letter download link. WBPSC MVI Admit Card will appear on the screen. Through the above page, we have mentioned all the information of WBPSC MVI Admit Card 2019. Hope this article is very helpful for all the applicants. We advise all the candidates that must and should download the Admit Card without any delay after released by the officials. All the applicants know the importance of the Hall Ticket/ Admit Card at the examination hall. So candidates must and should carry the Hall Ticket for the Exam without fail. Candidates, who want to know more government jobs recruitment, admit cards, result syllabus, previous papers, merit list, cut off marks and final shortlisted details, they should visit our website Sarkarirecruitment.com regularly.